So I've been looking at my website visitor statistics over the last few days, and I've noticed a few cool things. Beyond my regular visitors such as Mike in South San Francisco, Joe in Concord, Pike in Canada and Steve-o in Kuwait, I've noticed a huge increase in traffic from overseas. On a normal day, I'll have about 15 unique visitors to my site. Last Wednesday I had about 3 x's that. 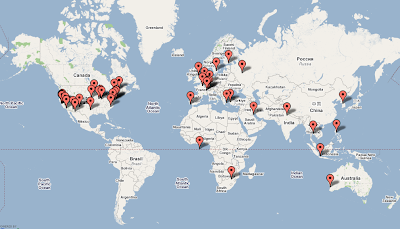 The new users came from Russia, Switzerland, Holland, Australia, Greece and other places. I'm thinking somebody linked my webpage to their site or maybe Google crawled through it. Who knows? I do also get a about 5 people that visit me on a regular basis who I have no clue who you are. The most frequent visitor is somewhere in San Jose and it's not me. I do have other people from Phoenix (not Frenchy), Dallas and New York. All of these mystery guests visit me at least once per week. I do encourage you to leave a comment and become part of the BigAlsHouse'com community. I may start to put some advertising banners on here and if I can maintain the explosive growth that I've had on Wednesday, I may be able to afford a McDonald's Happy Meal by the end of the year. I'm always in the know with your site!!! Thanks for the Yeah Area update & shout out bro. I'll see you at the end of May!